Korean-born Canadian cellist Eric Han made his concerto debut with the Toronto Symphony Orchestra at the age of 14. Following his debut, he had many engagements with Toronto Sinfonietta, Toronto Chamber Players and Boston’s Symphony by the Sea. As a guest artist and Artist in Residence, Han has participated at various festivals including the Moritzburg Festival, La Jolla SummerFest, Music@Menlo and Sarasota Music Festival, among others. Han studied with David Hetherington at the Glenn Gould School, and holds a Bachelor of Music from the Colburn School of Music under the tutelage of Ronald Leonard. 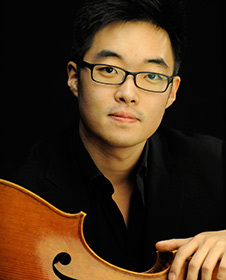 Han is a recent graduate of the Curtis Institute of Music, where he studied with Peter Wiley and Carter Brey. Han plays on a cello made by Frank Ravatin on generous loan to him by the Maestro Foundation.